A reader who saw my posting about www.wordcount.org, also suggests http://babynamewizard.com/namevoyager/lnv0105.html (Thanks Carol!) She calls it the coolest website ever and God's gift to fiction writers. She's right. The site is the creation of Laura Wattenberg who labels it the "guide to every aspect of baby name style." You plug in a name and up pops a graph that displays the waxing and waning of the popularity of the name. My first stop was the obvious. JILL was #109 in popularity in the 1950s when my mother chose it. MARY dropped from #1 in 1890 to #63 in 2004. SUSAN graphs out like a witch's hat. From hardly there in the 1890s to a rapid rise to #4 in the 1950s and then a plunge. That's proof that every other girl in my high school class was named Susan. Type in MEREDITH and you can see it shift from blue (a boy's name) to pink (the #153 in popularity in girl name in the 1980s). Wattenberg (Laura -- #21 in 1880s; #16 in the 1960s; #129 in 2004) also has a blog that examines names as cultural indicators. Her latest posting analyzes name popularity according to red-blue states. For example, you'd be more likely to meet little Hannahs, Annas and Abigails populating the pre-schools in red states; at the birthday parties in coastal urban centers, guests would be Ashley, Sarah and Caroline. As Laura explains, the strength of tradition seems to be biggest theme. Red staters are more prone to neologize--to create new names from surnames (Tanner), place names (Brooklyn), or simply appealing sounds (Kaden). Blue staters are more likely to stick to traditional naming stock. "In other words, the political conservatives turn out to be the naming activists, and the political progressives are the naming conservatives." So, if you're naming a baby -- or a character in a novel -- make sure to check it out here first. I love words, looking them up in dictionaries, moving them around in a sentence just to see what happens. In the writing class I teach at juvenile hall, I frequently challenge the kids to open a book at random, pick a half dozen words and make a poem out of it. Try it yourself sometime when you need inspiration. Knowing about my word fixation, my friend Susie told me about this great web site that takes "found poetry" to a new level. Now I'm addicted; it's better than computer Solitaire for avoiding getting down to real work. Wordcount (www.wordcount.org) is described as an "interactive presentation of the 86,800 most frequently used English words." In case you're wondering, THE is #1 and CONQUISTADOR ("a leader in the Spanish conquest of America and esp. of Mexico and Peru in the 16th century") is #86,800. Those are the guys with the weird hats. Go to the site, launch Wordcount, and start by filling in the word of your choice. What you get is your chosen word with its ranking, followed by the four or five next in order. When I plugged in my name -- Jill -- it came up at the 8,335 spot. The words around it created a mysterious poem with a definite religious flavor. Try it yourself and then post your findings here. I'd love to see the results of your random poetry. A warning to parents: Yes, pretty much any off-color word that you can imagine is included on Wordcount. We English-speakers definitely use them a lot. For example, the SH** word (#4499) follows right after TAXI. Here’s where and when I’ll be reading and signing books. Join me for a family event celebrating the complexities and blessings of the foster care system. I’ll be reading from my new middle reader novel, featuring Cal, an eleven-year-old who finds herself in a group home with four other girls and being watched over by a strange old woman everyone refers to as the Knitting Lady. This event is supported by and in appreciation of CASA, Court Appointed Special Advocates, who are dedicated to provide a voice for abused and neglected children in the juvenile court process. Treats are provided and conversation is encouraged during this important and fun event. Through the person of one Carolina Agnes London Indiana Florence Ohio Renee Naomi Ida Alabama Lavender, or Cal Lavender for short, Wolfson offers insights about foster care, the resiliency of the human spirit and how, in times of need, families are sometimes stitched together under the most unlikely circumstances. Wolfson, a former Mercury News writer and editor, has written extensively about the juvenile justice and family court systems. But her story this time is wisely personal and intimate, told by Cal, a young girl whose world comes unraveled when her unstable mother loses control in a public place and the authorities move in to protect Cal. Her disbelief at finding herself in a foster home neatly captures how not just children but plenty of adults feel about their lives. ``Everyone is always living her story. ``When I first heard this, I thought: What kind of nutty philosophy is that? Who would buy it? Everyone. Always? So begins ``What I Call Life,'' and Wolfson proceeds to neatly intertwine Cal's story with a back story involving the orphan trains of the late 19th and early 20th century that brought children to the Midwest and West from Eastern cities. Just how the girls cope is part of the story, too. Cal works furiously to control the environment around her, presenting a facade to the world that includes ``My Face for Unbearably Unpleasant and Embarrassing Situations.'' Another girl doesn't talk. A third invents a sister with whom she plans to reunite. Together, under the wily, subtle guidance of a foster mother known simply as the Knitting Lady, they and other girls in the home learn to live their own stories. 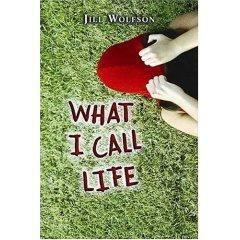 There is wisdom to be found here, but Wolfson doesn't smack her young readers over the head with newfound knowledge. Instead, she delivers believable dialogue in a nicely paced, sensitive book. I'm getting some great feedback on my new novel for middle-readers.